WAREHAM, Mass. 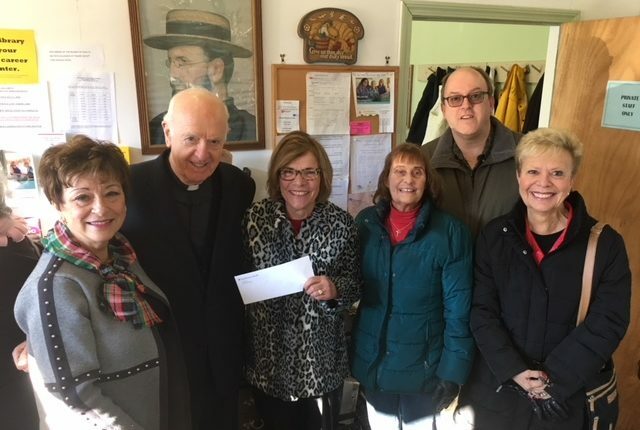 — Members of the executive board of the Tobey Hospital Guild presented Father Columban Crotty, President of the Family Pantry-Damien’s Place, with a donation to help purchase food for those in need in the greater Wareham community this holiday season. The Tobey Hospital Guild is a non-profit organization whose purpose is to render service to Tobey Hospital, its tax-exempt subsidiaries, its patients and to assist in promoting the health and welfare of the community. The Guild raises money throughout the year by hosting fundraisers. Joining the Guild is a great way to become involved in your community hospital. Members serve as ambassadors to the community on behalf of the hospital and Southcoast Health. For more information or to join, please call Sandy at 508-291-1643 or email jandsbeck@verizon.net.